C.J. 's Beach Bays Team is committed to providing quality customer service to the people of the community as well as the people that vacation in our resort towns. As part of this commitment, Beach Bays has maintained the NAPA Autocare affiliation to provide The NAPA AutoCare Piece of Mind Warranty for all customers. Beach Bays is also a AAA Approved Auto Repair Center which offers customers the ability to "Show Your Card and Save" as well as supporting the AAA Member Benefit Warranty to customers that have a AAA membership. At CJ's Beach Bays, providing quality service at affordable prices is our business. Our experienced technicians perform both preventative maintenance and repairs, and work on all makes and models of foreign and domestic vehicles, including hybrid and electric cars. Click here for a full list of services we offer. Please call or contact us with any questions regarding our services. I want to thank the staff, C.J. and Karen for all their personal concern and attention to my 1999 Chevy Prism and any problem that I bring to the office. When I drive my car to C.J. 's I leave the office with a feeling of trust and confidence in the professional people that treat me with respect. There is an easy way to put money back into your pocket without clipping coupons. AAA members receive 10% discount off of labor up to $50.00 everyday. Just show your card and start saving. We also accept AAA reward vouchers which can be used just like cash. Schedule your appointment today. Car repair gone green! C.J. 's Beach Bays is now a Qualified Hybrid Repair Shop. 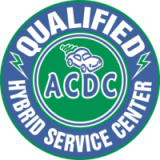 We are the only ACDC Certified Hybrid Service Center on the eastern shore. So relax and enjoy your time at the beach and have peace of mind that your hybrid is being serviced by trained technicians. ©2019 CJ's Beach Bays. All Rights Reserved.